Cool weather got you looking for comfort food? 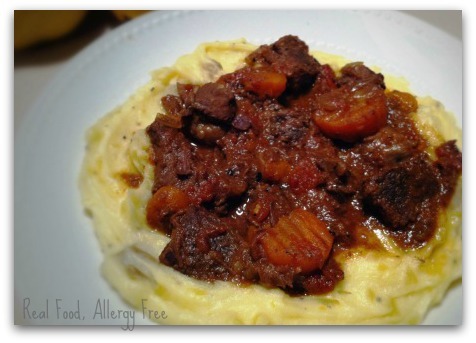 Chunky beef stew with carrots and onions served on top of mashed potatoes is sure to satisfy. Throw the ingredients in the crockpot and go about your business for the day. When you are ready to eat, whip up your favorite mashed potatoes and enjoy this hearty meal. Dump all ingredients except arrowroot or cornstarch into the crockpot and stir. Uncover crock and stir in arrowroot or cornstarch and turn heat to high to thicken sauce. Serve on top of your favorite mashed potatoes. You may also enjoy Rotisserie Chicken in the CrockPot Recipe and Easy Barbecue Chicken in the crockpot. Recipe adapted from Full Bellies Make Happy Kids. Photo courtesy of my 11 year old daughter. Pretty good, eh? 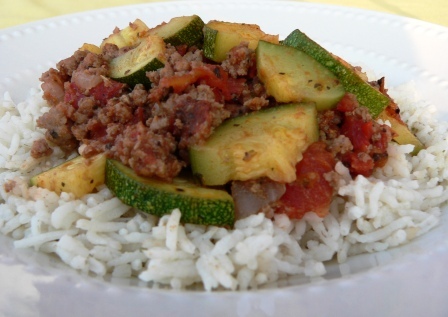 Here’s another quick and easy zucchini dinner. It is thick and hearty so it can be served as is or over rice or pasta. A side salad would make a great addition. In a heavy skillet, cook ground beef and onion until beef is done and onions are clear. Add tomatoes, zucchini, seasoning, salt and pepper and cook until zucchini is tender. You may also enjoy Italian Sausage and Summer Squash Skillet and Cheeseburger Zucchini Boats. Getting children to eat green and slimy vegetables can be a challenge. Sometimes all you need is a toothpick and a piece of paper to build enthusiasm. My little ones were actually excited to try these. They got 2 thumbs up from everyone but the youngest. She was able to eat them once we covered them with ketchup. This recipe comes from Laura at Heavenly Homemakers. This week I’m going to make it with Italian seasoning or possibly spaghetti sauce. I’ll let you know how it works out. Update: We tried spaghetti sauce! 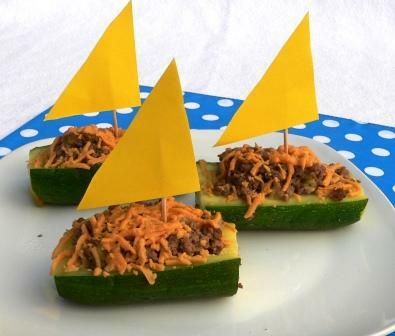 Check out our spaghetti zucchini boats here. Put a pot of water on the stove and bring to a boil. Cut the ends off the zucchini and slice lengthwise. Halve the zucchini if necessary. Boil the zucchini for about 10 minutes. Meanwhile, brown the ground beef and onions and season with garlic powder, chili powder, salt and pepper. Scoop the “meat” out of the zucchini and into the beef. Stir well. 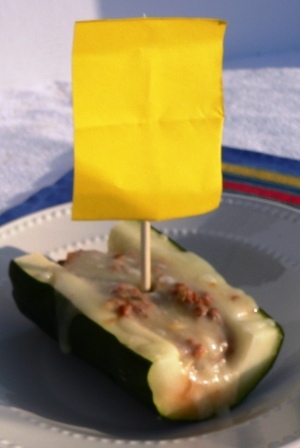 Fill the zucchini with hamburger mixture and top with cheese. Bake until cheese is melted.